Face painting. It's where we got our start in this business, clear back in 1999, and it's still our #1 most requested service! Q. What do you charge for face painting? My rates start at $150 per hour. I am only available for events on Saturdays and Sundays, with a few exceptions (call if you have a weekday event, and we'll see if I can make it work). Additional fees may apply for events outside our usual service area, for holidays or peak dates, or for events booked with less than 2 weeks notice. Face Painting speed: 10-12 detailed designs per hour, or 15-20 quicker designs per hour. For very large volume events, additional face painters may be available, rates will vary. Contact me for details. Q. Do you have a studio? Is there somewhere I can come just to get my face painted for the big game/masquerade party/etc? A. I currently work out of my home studio by appointment. Give me a call and I can come up with a special design just for you! I'll even throw in temporary hair color spray or hair glitter, if you wish, at no additional charge! For private face painting sessions at my home, my minimum is $60 for every 30 minutes. I can do a VERY elaborate and detailed face or painted tattoo design in 30 minutes, or 2-3 moderate detail ones, if you'd like to get a few friends together! I charge for my time, not by the face. If you would like me to come to your home or place of business to paint, my regular hourly rate applies and the minimum is one hour. Q. What kind of face paints do you use? A. I use only professional face paints which are FDA compliant for cosmetic use. The brands I use are TAG, Global, Paradise, Diamond FX, Ben Nye, Superstar, and Wolfe FX. Although most people call these "face paints" they are not actually paints... they are water-based makeup, designed just for skin! I also use only cosmetic grade glitters, which are never gritty or harsh on the skin or dangerous around the eyes, as craft glitters can be. Q. What ages will you paint? A. I will paint pretty much anyone who wants to be painted! There is no age limit. Face painting is popular with little children, older children, teens, adults and even the elderly! Q. What is the best way to remove face paint? A. The easiest way to get it all off is to apply a little bit of baby shampoo or glycerin -based soap directly to the painted design, rub gently with fingers until all the paint is mixed with the soap into a muddy-looking mess, then use a warm wet washcloth to gently remove the soap and face paint. There is no need to scrub hard! Makeup remover is also not needed, since it is designed to remove regular makeup, which is oil-based... face paint is water-based, so plain water with just a touch of mild soap works best. In a pinch, baby wipes also do a good job of removing face paint. Some colors (especially greens) may leave a temporary shadow or light stain on some people's skin, especially those with very pale and very dry skin. This is harmless and will fade in a few days. If you would like to prevent this, try moisturizing your face with your favorite facial lotion before having your face painted. Q. 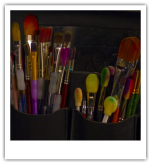 How do you keep your paints and supplies hygienic? A. Face paint is not like regular makeup, which is designed to be used by only one person. 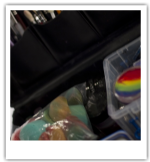 Professional Face Paint is actually designed to be used on many hundreds of faces, and therefore has high levels of antimicrobial ingredients to keep it safe and hygienic. Also, we are conscientious about rinsing out our brushes thoroughly in between colors and customers, and changing paint water often. We use only one sponge per customer. If someone looks ill or has breakouts or infections on their skin, we will refuse to paint them. We also will not paint over open wounds, eczema, or sunburned skin. This may seem harsh, but it is to keep them and the rest of our clients safe. Sometimes we will suggest painting a design on unaffected skin on their arm instead. Keep in mind that kids are more likely to "catch something" while waiting in line with other kids, then they are in my face painting chair! Q. Is it safe to use watercolor crayons or acrylic paint to paint faces? A. Craft paints and craft glitters are not made for skin, and are not safe to use! It's a good idea to always ask a face painter what they are using... and make sure it's made for skin! "Non-toxic" only means it won't kill you if you eat it... it doesn't mean you won't break out or itch if someone puts it on your skin, and it doesn’t mean it’s easy to wash off! Only products made for skin should go on skin!